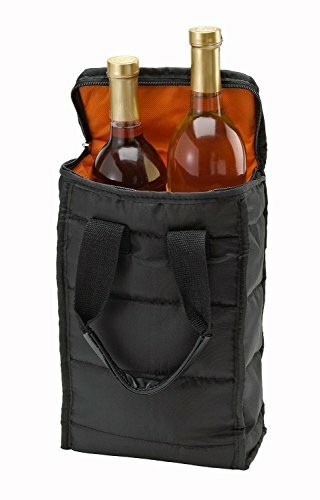 Wine Carrier Tote Bag - Attractive wine bag with thick external padding, zipper and easy to carry handles. The wine tote bag is perfect for travel, picnics or a day at the beach. When you want to bring wine along to a friend's dinner party, the beach, a picnic, outdoor concert, or anywhere else that pairs well with a bottle of red or white, you need to get it there safely. A store bag with those annoying cardboard pieces just won't do it. But our insulated wine carrier bag is the perfect solution! Four pockets are each roomy enough to fit four standard-size wine bottles upright, and soft dividers keep them from clanging together. The wine tote bag has a durable zipper top that provides a dependable seal so bottles remain secure. Two extra-long handles mean you can carry it easily, especially when you're bringing along other items like food to go with your wine. Extra thick external padding keeps the wine bottles safe. This attractive wine bag makes it great for use anytime you need to tote wine somewhere else. In fact, buy two wine bags so you can give one to a friend. Just fill it with four bottles of their favorite wines, and you'll be giving them five gifts in one since they'll be able to reuse the bag again and again. That's because the foldable material provides easy storage when your picnic or other event is over. Once you've served the wine, just fold it and tuck the reusable wine tote bag back in your picnic basket or beach bag and use it next time. Four wine carrier pockets are each roomy enough to fit four standard-size wine bottles upright. Durable zipper provides dependable closure; two handles make the wine bag easy to carry. Extra-thick padding secures the wine tote bottles in place keeping them from clanging together. Attractive wine carrier makes it great for use with travel, picnics, beach days, and more. Foldable canvas material offers easy storage when not in use as a wine bag and makes a great gift.